IQS REVERBERATOR - plugin reverb for Sawplus & Sawpro etc... only for this product. Once you've set up a patch, simply remove the Reverberator from the FX patch point, drag the newly created stereo reverb region up to an adjacent track to the actual sound you have treated, then adjust the volume between the two utilising the track faders. How about reversing that reverb ?!!..... 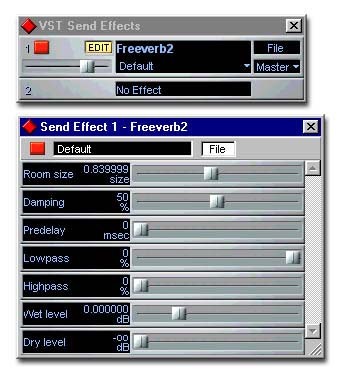 Simply add the "Reverse Audio" FX to the reverb tracks' FX plug-point, and hey presto... Real reversed reverb.... Hey you can also drag the reverb around in time, to create reverb off-sets....or how about delayed reverb !!!.... Yup.... You can get really creative.....and I have to say.....er....You can really use this thing without reg'ing it !! !....You just can't access all the comb filters, or save your customised sets....but you can edit a custom patch AND apply it ! !....It's great as it comes, so imagine what you could do once you've registered !